Sometimes it only takes a short time to claim a place in football history. It took less than two minutes for Manchester United to score two goals to come from behind in the 1999 Champions League final. A split second for Zinedine Zidane to headbutt Marco Materazzi and cost his national team the 2006 World Cup. And exactly one minute for Krylya Sovetov Samara, a football club from one of the host cities of the 2018 World Cup, to become the first team in the world to field citizens of North and South Korea at the same time. The minute itself wasn’t particularly eventful. The South Korean player, Oh Beom-seok, had started the game for Krylya Sovetov against Amkar Perm on 2 May 2008 and played until the final whistle. The North Korean, Choe Myong-ho, was only brought on for the last minute as a substitute, in the process making his debut in the Russian Premier League. Oh was the first who greeted Choe on the pitch. Choe touched the ball only once. Then it was all over, both the game and this chapter in the North-South relationship. They never played together again. Of course, the full story lasted longer than a minute. In 2004, Krylya Sovetov had the best season in their history: they finished third in the Premier League, their highest ever position, and reached the final of the Russian Cup. Just a year later, they lost the main sponsor. The fall from grace was spectacular. Krylya were taken under the control of the regional administration, made to sell their best players and barely escaped relegation. Their new strategy was to take new players on loan rather than buying them, in order to avoid spending too much. One club employee was particularly inventive when it came to this strategy. Officially, Arnold Epshtein was Krylya Sovetov’s press officer — but in fact he was much more than that, handling everything from the scouting department to helping players in their life off the pitch. In September 2005, he was watching the under-17 World Championship in Peru and couldn’t help but notice the surprising performances of the North Korean national team, who drew with Italy and only lost to Brazil in the quarter-finals. Their best player, the attacking midfielder Choe Myong-ho, scored three goals and was dubbed the “North Korean Ronaldo” by the press. If Epshtein had shown the letter to anyone in Russia he would have been ridiculed for its classically Soviet expressions of fake praise and sweet talk towards Kim Jong-Il and the Party. But not in North Korea. He passed the letter to his tour guide on the first day of his trip in the shadow of a gigantic statue of Kim Il-Sung. The very same night, the phone in his hotel room rang. The man on the other end said that the proposition would be considered. A few months later, North Korea’s reply reached Samara: we are happy to send you some players, you just have to come over and choose them. On his second trip Epshtein came prepared, equipped not with a letter but with a video. It presented Samara as the perfect place for North Korean citizens to live and work, featuring footage of army parades, Lenin statues, high-flying flags, war memorials and the wonders of Russian nature set to martial music. The vast spaces with pompous architecture and few people on display created a false likeness between Samara and Pyongyang; just as North Korea could be viewed as a variation on the Soviet Union, Epshtein’s version of Samara was a variation on 21st century North Korea. And it worked. 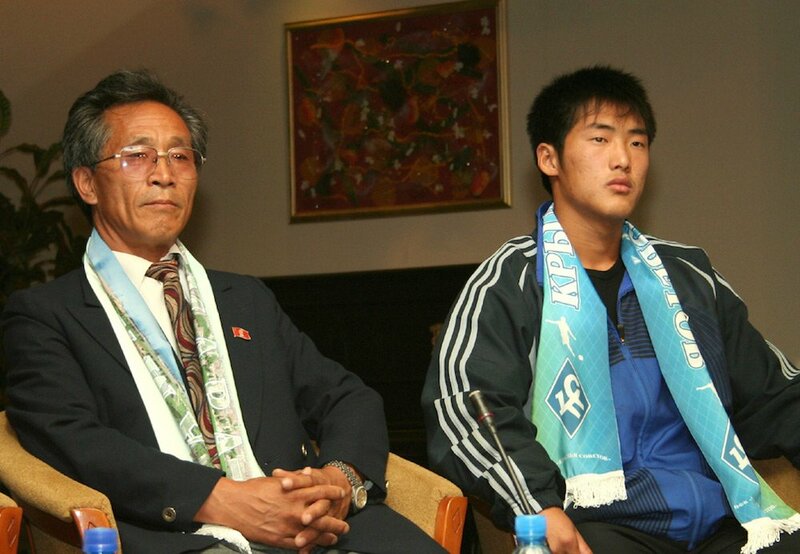 Epshtein and two scouts from Krylya Sovetov were offered the chance to take Choe Myong-ho to Samara. They were shown a fax from, of all people, Real Madrid. Apparently the Spanish giants tried to approach Choe after the under-17 World Championships, but the North Korean football federation decided not to reply: they didn’t want any money for his transfer. Instead, they wanted to demonstrate that their best young players couldn’t be lured by offers from imperialist countries, and would go where the Party told them to. And Party had told Choe to go to Russia. Oh Beom-seok’s journey to Samara couldn’t have been more different. In fact, it was simply ordinary. The right-back broke into the South Korean national team in 2005 and eventually established himself as a regular starter. In 2007, Krylya Sovetov scouted him at the Asian Cup and signed him on a salary of 30,000 euro ($34,695) per month — in stark contrast with Choe’s remuneration of 15,000 roubles ($240). When the two ended up at the same club, this contrast was the main thing to catch the eye, over and over again. Choe didn’t arrive to Samara on his own. A constant presence by his side was an interpreter named Jeong, a graduate of the University of Sport in Kyiv and, Epshtein supposes, a member of North Korean Security Service. Jeong didn’t just translate for Choe — he took full control of the young man’s life. They lived together in a small room on club premises and never appeared in public separately. When Choe was first invited to one of the team’s informal dinners, Jeong declined the invitation on the player’s behalf, saying that he had to prepare for the next game, even though this was still five days away. None of this applied to Oh Beom-seok. He also had a translator, named Kim, but they acted like friends, riding around Samara in search of Korean food and late-night disco. Oh instantly hit it off with the rest of the team and attended every informal gathering. Oh and Choe shared the pitch in training but the latter always kept his distance. And off the pitch? “Neither Choe nor Jeong ever even tried to speak to us,” says Kim. So it all came down to that one minute of Russian Premier League action. Two weeks later the season ended, and Choe and Jeong flew back to their respective countries. They never returned. Why not? 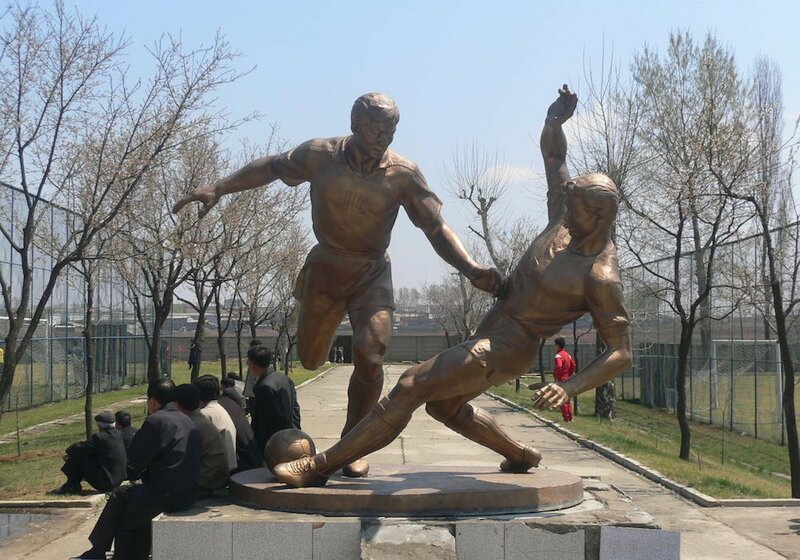 Was it because of what had happened, a North Korean and a South Korean together on the same pitch? Possibly, but prior to that game they had trained together for a year without any problem. Oh Beom-seok soon left Samara as well, going on to play for his national team against Lionel Messi at the 2010 World Cup. Choe Myong-ho recently popped up playing in Cambodia.